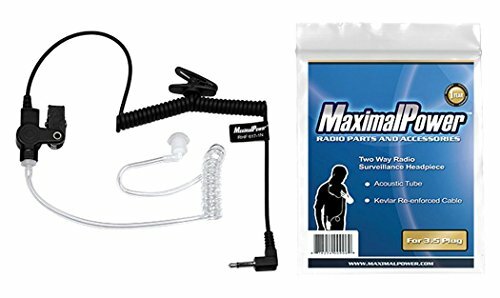 MaximalPower 3.5mm RECEIVER/LISTEN ONLY surveillance headset earpiece with clear acoustic coil tube earbud audio kit for two-way radios, transceivers and radio speaker mics jacks fits standard two-way radios transceivers and radio speaker mics for such as MOTOROLA, KENWOOD, ICOM, ADI, ALINCO, and YAESU. 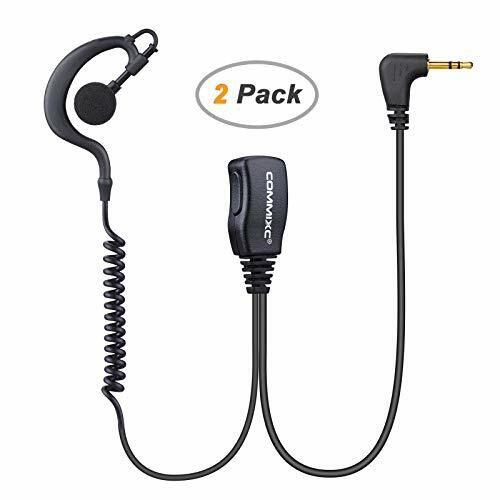 This earpiece also works with MP3 players, remote mics and other audio devices or accessories with 3.5mm earphone jack connector. This surveillance headset is rugged design, polyurethane jacketed and made with heavy duty material with superb audio quality. The reinforced earphone clip provides cable retention and eliminates strain on earphone. It is 100% compatible with all original equipment manufacturer (OEM) parts and ideal for high noise level environments and discrete listening. FEATURES: Output Level: 72Db, Rated Input Power: 0.1W, Maximum Input Power: 0.2W, Output Impedance: 32 ohms. Works with the following devices: Any MOTOROLA (CP200, CP200 XLS, GP300, EP450, PR400, HMN9030, PMMN4050, PMMN4059, PMMN4069, RLN4941) Any KENWOOD (KMC-25, KMC-26, TK-208, TK-220, TK-240, TK-248, TK-250) Any ICOM radio, Remote mic, and speak mic with a 3.5mm earphone jack. Amazon.com is the only authorized dealer selling MaximalPower brand products. Please make sure your item is ONLY sold and shipped by Amazon.com! All other marketplace vendors are selling counterfeit products that do not perform the same, and/or are not covered by our MaximalPower Warranty. Output level: 72dB, Rated input power: 0.1W, Maximum input power: 0.2W, Output impedance: 32 ohms. Polyurethane jacketed, Heavy Duty Material, Superb Audio Quality, Rugged Design. If the sound quality for receiving starts to get fuzzy,please disconnect the clear tube ear piece and blow it out with an air in a can, because the air in the tube will effect the transmission. If you clear the tube earpiece and the white tube is intact but the issue still isn t solved, please contact with us. Hands free compatible with radios and the acoustic tube fits snugly in the ear and keeps your conversations private. The acoustic tube fits snugly in the ear and keeps your conversations private. 360 stainless fixed clip that you can fix the PTT to the convenient place. Excellent for use in police military nightclubs bars paintball security restaurants hotels bouncer warehouses and noisy environments. Simple and Convenient return process; 60 days warranty and 30 days no reason to return. Notice: if the sound quality for receiving starts to get fuzzy,please disconnect the clear tube earpiece and blow it out with an air in a can,because the air in the tube will effect the transmission.If you clear the tube earpiece and the issue still not solve ,please contact with us.In addition, please rotate the white tube until it stuck in the connection. Before you order it, please double-check if your radio model in the compatible list. Two-pin standard diameter: Ear 3.5mm stereo (top pin). Mic 2.5mm stereo (bottom pin); that work with most two way radios. It Can be adjusted the volume by change the operation of mic; that s convenient to control the volume. 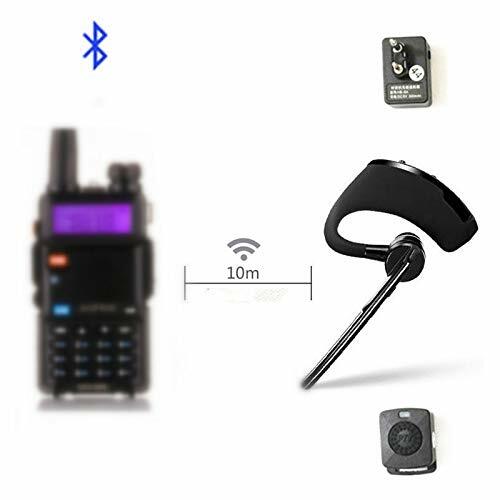 Compatible with Motorola P25, Motorola DMR MOTOTRBO two way radios including but not limited to XPR 6000 Series: XPR 6100, XPR 6350, XPR 6380, XPR 6550, XPR 6580, XPR 6500, XPR 6300, XPR 7000 Series: XPR 7550, XPR 7580, XPR 7350, XPR 7380, XPR 7000e Series: XPR 7550e, XPR 7580e, XPR 7350e, XPR 7380e, APX 1000, APX 2000, APX 3000, APX 4000, APX 4000XH, APX 6000, APX 6000XE, APX 7000, APX 7000XE, APX 7000L, APX 8000, APX 8000XE, SRX 2200 XiR-P8200 XiR-P8208 XiR-P8260 XiR-P8268 XiR-P8608 XiR-P8660 XiR-P8668 DP3400 DP3401 DP3600 DP3601 DP4400 DP4401 DP4600 DP4601 DP4800 DP4801 DGP4150 DGP4150+ DGP6150 DGP6150+ Combat Radio. Compatible with Motorola P25, Motorola DMR MOTOTRBO two way radios including but not limited to XPR 6000 Series: XPR 6100, XPR 6350, XPR 6380, XPR 6550, XPR 6580, XPR 6500, XPR 6300, XPR 7000 Series: XPR 7550, XPR 7580, XPR 7350 XPR 7000e Series: XPR 7550e, XPR 7580e, XPR 7350e, XPR 7380e, APX 1000, APX 2000, APX 3000, APX 4000, APX 4000XH, APX 6000, APX 6000XE, APX 7000, APX 7000XE, APX 8000, APX 8000XE, XiR-P8200 XiR-P8208 XiR-P8260 XiR-P8268 XiR-P8608 XiR-P8660 XiR-P8668 Combat Radio. 3 foot Kevlar reinforced cable. Replaceable coil tube and earbud. Radio adapter has integrated Push-to-Talk (PTT) button. 2-Wire Design for the ability to split mic and speaker wires. deal for demanding covert security applications where sound clarity and earpiece durability are of paramount importance. Excellent for use in police, military, nightclubs, bars, paintball, security, restaurants, hotels, bouncer, warehouses, and noisy environments. 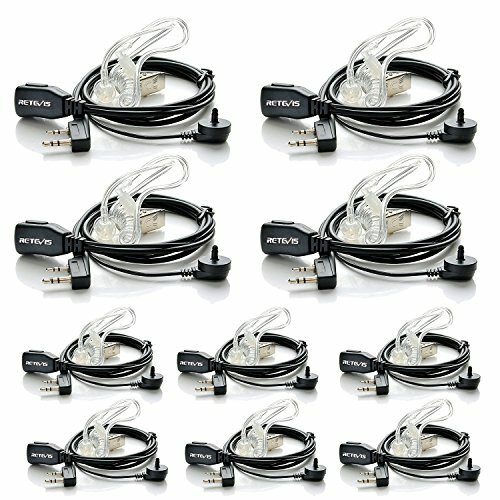 COISOUND 3.5mm single Pin RECEIVER/LISTEN ONLY surveillance headset earpiece with clear acoustic coil tube earbud audio kit for two-way radios, transceivers and radio speaker MIC jack fits standard two-way radios transceivers and radio speaker MIC for such as MOTOROLA, KENWOOD, ICOM, ADI, ALINCO, and YAESU. 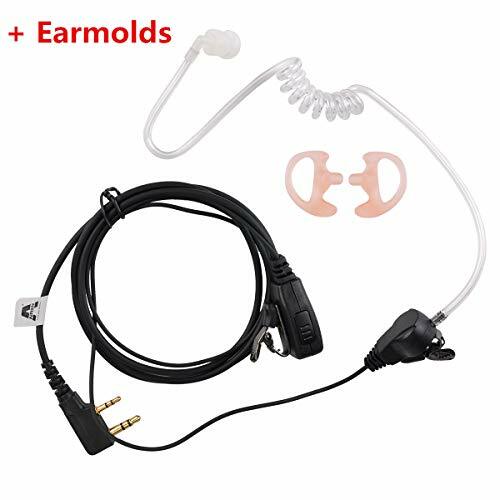 This earpiece also works with MP3 players, remote MIC and other audio devices or accessories with 3.5mm earphone jack connector. This surveillance headset is rugged design, polyurethane jacketed and made with heavy duty material with superb audio quality. The reinforced earphone clip provides cable retention and eliminates strain on earphone. It is 100% compatible with all original equipment manufacturer (OEM) parts and ideal for high noise level environments and discrete listening. Works with the following devices: MOTOROLA (CP200, CP200 XLS, GP300, EP450, PR400, HMN9030, PMMN4050, PMMN4059, PMMN4069, RLN4941) KENWOOD (KMC-25, KMC-26, TK-208, TK-220, TK-240, TK-248, TK-250) ICOM radio, Remote MIC, and speak MIC with a 3.5mm earphone jack. Reinforced earphone clip provides cable retention and eliminates strain on headset. In high noise environment, you can hear clear sound, improve the listening effect and work efficiency. Do you have uncomfortable or worn ear molds for your two-way radio? Try the HDE ear mold replacement earpiece inserts. In keeping with our tradition of uncompromising quality and safety, these replacement molds are made of sturdy, hypoallergenic, medical grade polymer. Moreover, these molds will fit comfortably in each ear and are designed to fit most coil audio kits. 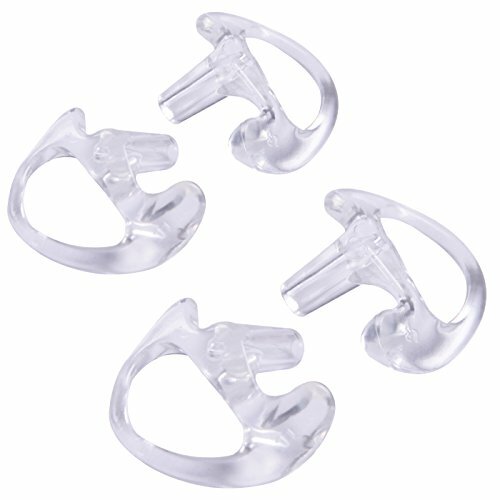 Each pack includes one pair of medium and one pair of large ear molds, and they are available in clear. Give your ears a break, and purchase these inserts today! More models, please to contact us for more details. 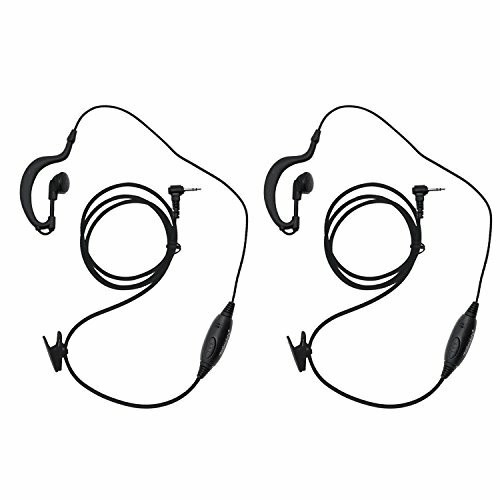 These Midland AVP-H3 headsets for Midland GMRS feature a wrap-around ear clip design with a speaker, lapel clip, and an inline VOX PTT switch. 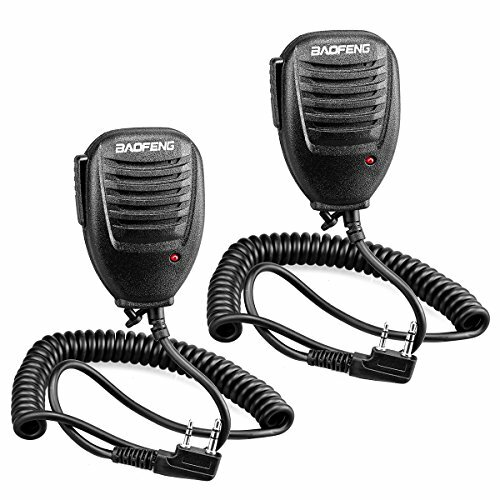 The pair of AVP-H3 is compatible with all Midland GXT, LXT and G-series GMRS/FRS radios. Wrap-Around Design These headsets wrap around your ear for more comfortable use than earbuds or larger headsets. Inline VOX/PTT Switch The inline switch sets you up for controlling VOX or Push-to-Talk features on your radio, and a lapel clip keeps it handy and out of the way. 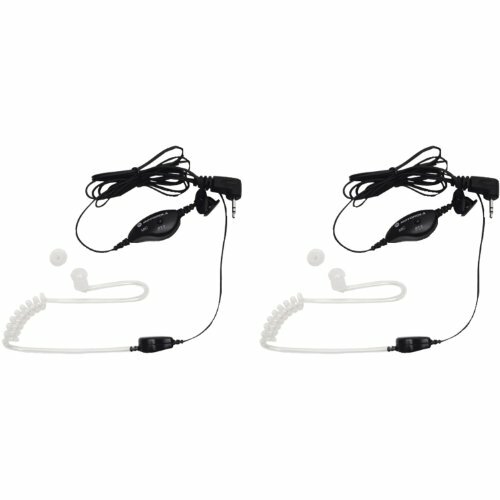 Go Hands-Free These headsets are ideal for hands-free operation, and the discrete transparent design makes them perfect for working security. TK-2107/3107 PRO-TALK, TK-2160/3160, TK-2170/3170/3173, TK-2200/3200, TK-3101/3131 FREE-TALK, TK-3130.TK-2207/3207. And all PUXING brand radios. And for TYT f8, BAOFENG UV5R, MML UV100, etc. Midland MXT275 MicroMobile 15 Watt GMRS two-way radio features a Fully Integrated Control Microphone, 15 GMRS channels and includes NOAA Weather Scan + Alert. For extended range, the MXT275 is equipped with 8 preprogrammed repeater channels. The unit includes an external Magnetic Mount Antenna and has a USB connection on the front of the unit to charge mobile devices. The ultra-compact design of the low-profile hide-away head unit will mount just about anywhere while all radio controls can be accessed from the hand-held microphone at the push of a button. The MXT275 also provides the ability to talk to other Midland and most other FRS/GMRS walkie talkie radios. Additional features of the MXT275 include 142 privacy codes, channel scan, programmable squelch, silent operation, flip frame mounting bracket and a high contrast backlit LCD display for day or night time use. The MicroMobile MXT275 is great for vehicles with limited dash space and is great for road trips, Off-Roading, Overlanding, UTVs and farm equipment. 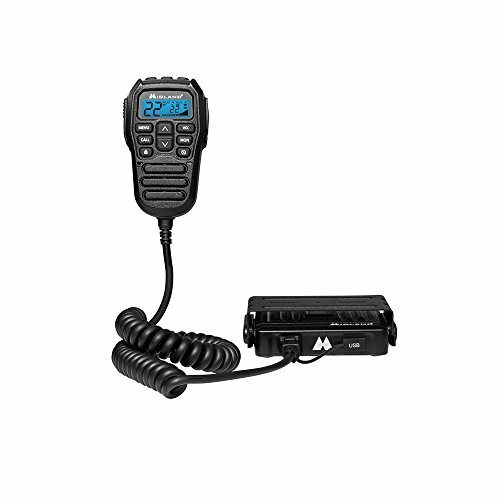 In the box you will receive the MXT275 MicroMobile radio, Fully Integrated Control Mic with holder, Flip frame detachable mount, magnetic mount antenna, 12 Volt power cord, and user's manual. 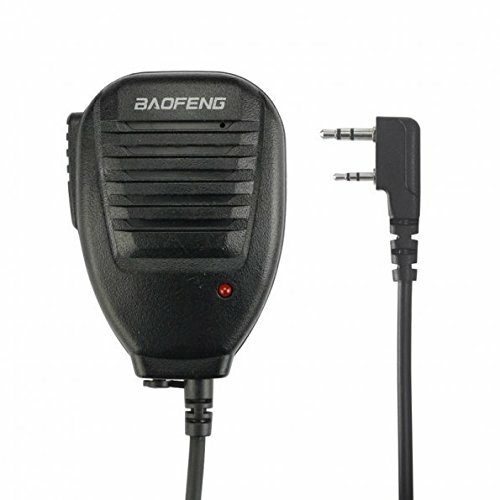 2-WAY RADIO - This 2-Way Radio features 15 High Power GMRS channels with 8 repeater channels. 50-MILE RANGE - Full 15W Radio with an external magnetic mount antenna for extended range. 142 CTCSS/DCS PRIVACY CODES - The privacy codes give you up to 3,124 channel options to block other conversations. NOAA WEATHER SCAN + ALERT - NOAA Weather Scan will automatically scan through 10 available weather (WX) band channels and locks onto the strongest weather channel to alert you of severe weather updates. NOAA Weather Alert will sound an alarm indicating that there is a risk of severe weather in your area. INCLUDED IN THE BOX - Radio, Fully Integrated Control Microphone, Mount, Detachable Antenna with Magnetic Mount, Microphone, Microphone Holder, 12V Power Cord with Car Power Adapter, Owner's Manual, and Quick Start Guide. The Motorola Surveillance Headset with Push-To-Talk microphone is great for covert or stealth missions, allowing discreet operation of your Motorola Talk about Two-Way Radios. 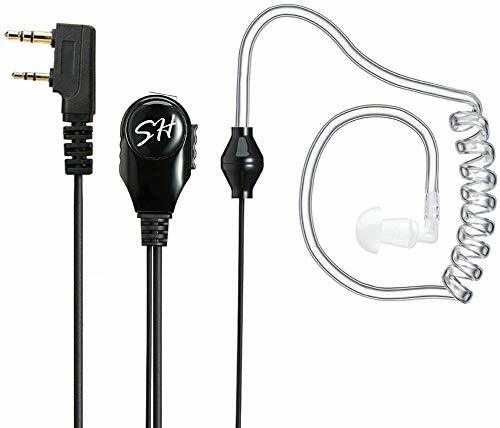 A clear earpiece and coiled cord provides a snug, comfortable fit - even under a motorcycle helmet - and reduces device visibility while hunting, attending a theme park or coordinating a wedding. The 1518 Surveillance Headset delivers crisp, clear sound even in noisy places. The cord length between microphone and earpiece provides flexibility for movement. The PTT microphone can easily attach to your clothing with an accompanying clip. 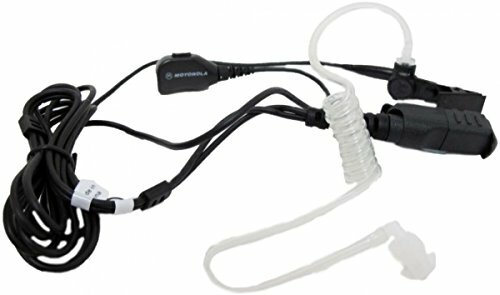 The Motorola Surveillance Headset with PTT Microphone is single-pronged and works with all Motorola Talk about FRS/GMRS radios capable of using a headset. No set up is needed, just plug into your two-way radios and enjoy. The Motorola 1518 Two-Way Radio Surveillance Headsets are compatible with these radios and accessories: MHP61, MHP71, MHP81, EM, FV200, FV300, FV500, FV600, FV700, FV800, MB, MC, MH, MJ, MR, MS, MT, MU, SX500, SX700, SX800, SX900, T4800,T4900, T5000, T5300, T5400, T5500, T5600, T5700,T5800, T5900, T6200, T6300, T6400, T6500, T7100, T7200, T7400, T8500, T8550, T9500. Discrete way to speak and listen. Built in Microphone and Speaker - with spring clip on the backside. Communicate with ease with the two easily accessible buttons. There is a headphone out port on the mic for an earpiece, and it will cut the audio from the speaker when properly inserted. There is a red transmit LED on the face. The clip on the back rotates to help you position your mic. These mics will clip to our backpack straps at our shoulder or in front for easy access and convenient communications. It is also easier to use these mics while in the car with your handy-talkies. The radio can stay in the cup holder while you use the mic. Speaker is super high quality, you can hear clearly and be heard clearly. Clip holds on tight and will not fall off randomly. Cord is strong and coil allows for good flexibility and reach. The have compatible with a separate 3.5mm audio plug. For those of you who want to have it as a microphone but don't want your party's voice to be hear out loud around you, it can be a nice accessory. use telescopic design and built-in noise cancellation compression sponge, also you can adjust the size to wear more comfortably. 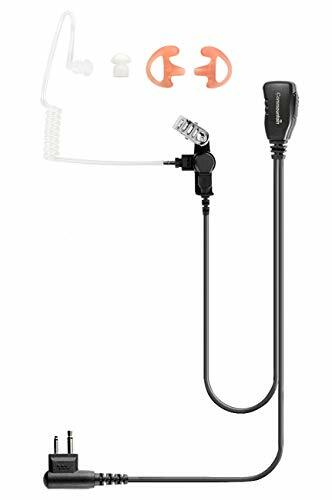 Amazingly Covert, Absolutely Efficient A new addition to our portfolio of high-quality radio equipment accessories is a game-changer - Tomsenn Covert Acoustic Tube 2-Pin Walkie Talkie Earpiece with an In-Line Mic. Why Choose a Tomsenn Radio Earpiece? 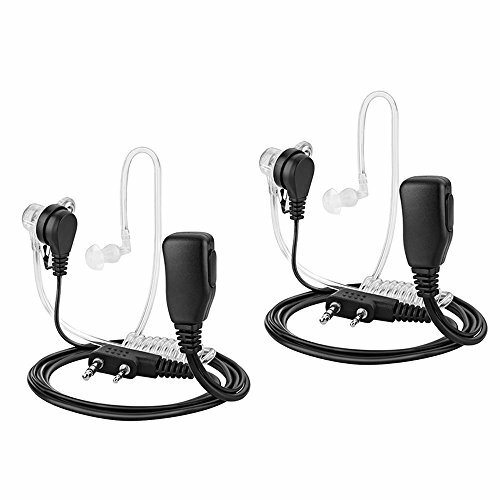 Transparent, Ergonomic Earpiece snugly fits, eliminating the need to hide it or constantly adjust it. This radio earpiece lets you communicate smoothly as it allows for no frequency drops - even in noisy conditions. Amazingly sensitive in-line PTT mic allows you to keep in loop with ease. A 360 degree stainless steel clip lets you attach the earpiece to your shirt collar with ease, for a no-nonsense hands-free experience. Compatibility Kenwood: TH-F6/F6A/D7/D7A/D7AG/D7E/F7/F7E/G71/G71A TH-G71E/K2/K2A/K2E/K2ET/21/21AT/21BT/22 TH-22A/22AT/22E/25/26/27/28/31AT/31BT/41AT/41BT TH-42/42A/42AT/2E/45/46/47/48/55/75/77/G71 TH-205/215/225/235/235A/235E/315/41 TK-208/220/240/240D/248/250/260/260G/270/270G/308 TK-360G/370/370G/372G/373G/320/340/340D/348/350 TK-378/378G/430/431/353/360 TK-2100/ 2102/2130/2160/3100/3101/3102/3107 TK-3118/3130/3131/3160 Linton: LT-2288/3288/6288/5288/3188/2188/3260/2268/3268 /6288/6188/3288A Baofeng: UV-5R/5RA/5RA+/5RB/5RC/5RD/5RE/5RE Plus/UV-82/BF-480/490/530/999/888/777/666S/777S/888S Wouxun: KG-UV1D/KG-UV2D/UVDIP/KG-669/659/679/689/639/699/801 Puxing: PX333/888/888K/328/358/999/666/777/777PLUS Note - If the brand/model for your radio walkie talkie headset isn t listed, please contact us to confirm the compatibility. COMPATIBILITY - This 2 way radio earpiece compatible with leading radio headset brands Kenwood, Puxing, Wouxun, Baofeng .DON'T WORK FOR Midland ,Icom Motorola Radio !!!! Please be sure to refer to the correct model selection when purchasing. If you are not sure whether it is compatible or not, you can consult at any time. Thank you! 90-day refund and 180-day warranty. 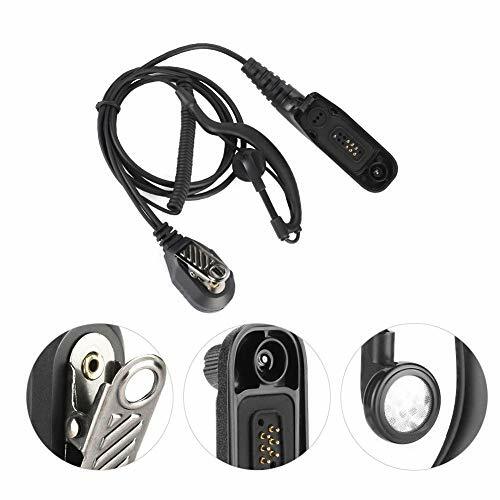 COMPATIBLE WITH MOTOROLA 1-PIN RADIOS - The 1-Pin walkie talkie earpiece compatible with motorola MC220R MH230 MH230R MH350R MR350TPR T100 T200 T260 T280 T400 T460 T480 T600 T605 T5000 T6200 T6500 T6550 T9500. See Product Description Below to Know More Compatible Radios. APPLICATION SCENARIOS - Commixc walkie talkie headset with Push-To-Talk (PTT) microphone is great for covert or stealth missions, allowing discreet operation of your Motorola Two-Way radios. HIGH QUALITY GOOD SOUND - The Two-Way radios earphone delivers crisp, clear sound even in noisy places, showing a meticulous and high-quality sound experience. Professional electroplated metal pin, 1-pin standard diameter 2.5mm, uses electroplating anti-oxidation design, effective to improve the life of the headset, avoid the poor contact situation. ERGONOMIC EARPLUG - The 2-way radio earpieces feature an ergonomic earplug that fits snugly in your ear canal, reduce the vacuum pressure generated by single headphones, and not easy to fall, wear a long time will not feel tired. 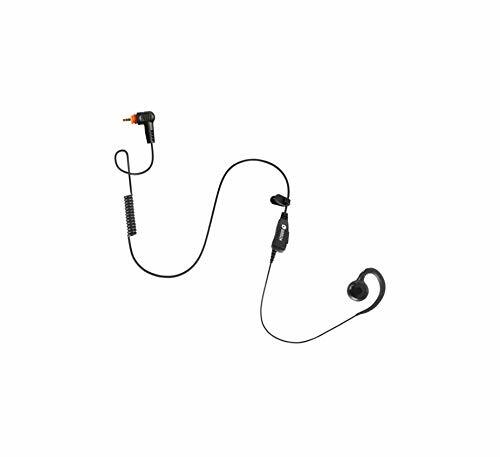 CONVENIENT TO USE - The cord length between microphone and earpiece provides flexibility for movement. The PTT microphone can easily attach to your clothing with an accompanying clip. No set up is needed, just plug into your two-way radios and enjoy. Note: If the brand/model for your radio walkie talkie headset isn't listed, please contact us to confirm the compatibility. 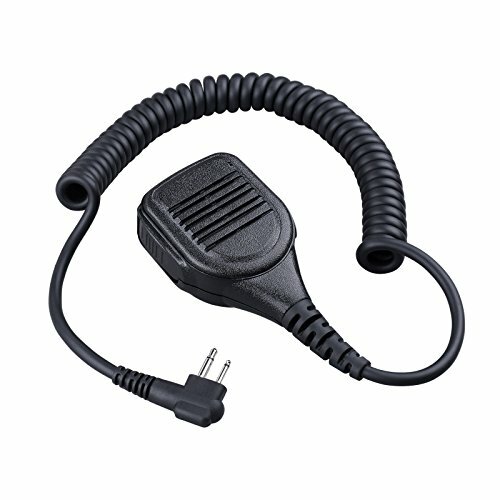 This Walkie Earpiece don't work for Motorola, Midland, Icom radio! radio headset The plug is the universal K head plug with transparent safety silica gel earplugs (removable). 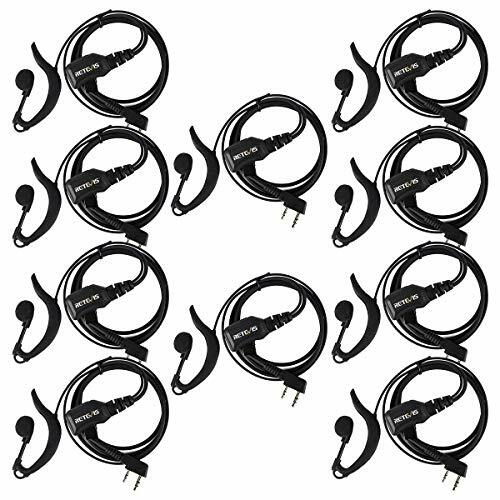 Used for all K head interphones. 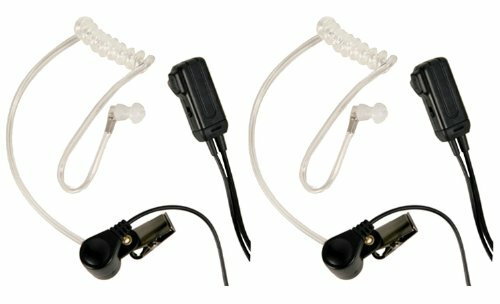 A surround ear clip with a loudspeaker, a lapel clip and an inline PTT switch, and with a small transparent silicone earplug accessory. 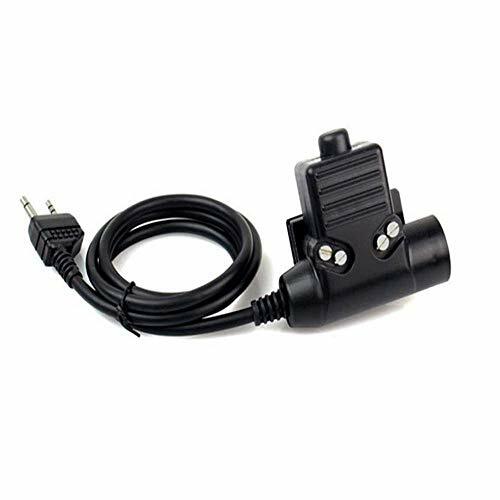 This SH-XT002 is compatible with all K head plug interphone devices. Amazon.com is the only authorized dealer selling SinHin brand products.Please make sure your item is only sold and shipped by Amazon.com! D ring loop earpiece fit well in ears without falls out for long time wearing. You'll never worry about if will drop during some activities, such as: hunting, camping, driving, cycling, photographing weddings and etc. With the advanced durable Pu cable and earpiece, you'll absolutely get convenient long period use. The durable PTT button with remote built in Mic allows you clip the button at suitable place to transmit nature sound and adjust the volume for clear radios calls; easy to operate the communications without holding radios. 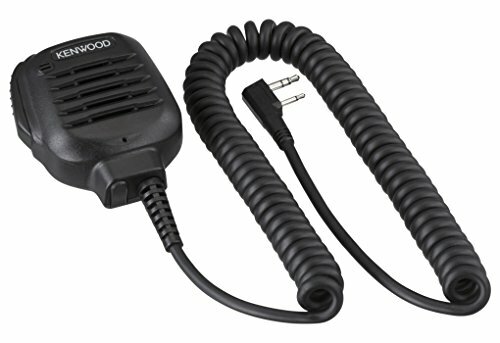 Looking for a replacement heavy-duty speaker microphone for your KENWOOD ProTalk radio? The KENWOOD KMC-45D 2-pin Heavy-Duty Speaker Microphone is what you need. It is water and dust resistant for the most rugged s and fits most ProTalk radios. or email us to tell us your model number, then we are happy to help you find the model which is suitable for your radio. 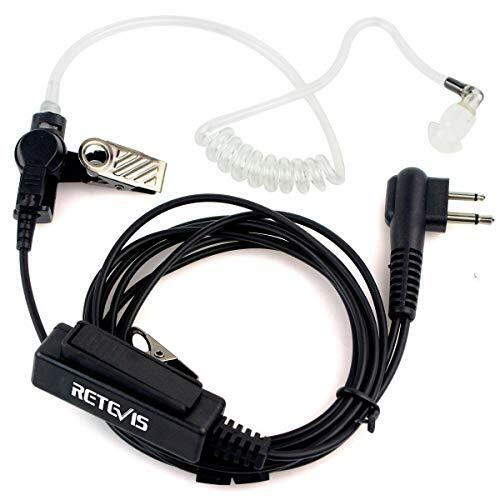 Wired Swivel Earpiece with Inline Push-to-talk and Microphone for Two-Way Radio. 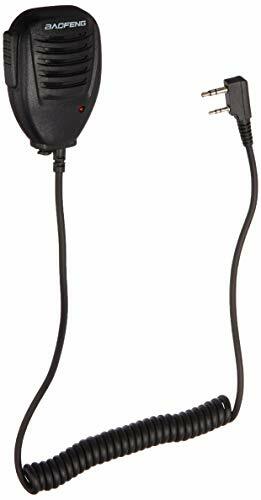 This earpiece provides clear voice transmission and excellent focused sound quality. It is a unique product that fits for retail marketplaces, restaurants and security companies. Enhance Communication: This earpiece produces high-quality sound. Users hear transmission clearly and receive effectively. Cozy Material: Users wear soft and skin-friendly material that fits right outside earlobe. User-Friendly Design: Metal clip on the PTT back clips securely onto lapel, collar or tie. Users are easy to adjust. Feels like nothing's there! - This D-Shape ear-band is designed to lightly hugs and contours to your ear shape. For our customers who are looking for a simple Snap-N-Go style. Non-adjustable, fasten securely onto the top and around the ear flap. Extremely soft and stretchy coiled cable that allow for a wide range of movement. Please be sure to refer to the correct model selection when purchasing. If you are not sure whether it is compatible or not, you can consult at any time.Thank you! COMPATIBLE WITH MOTOROLA RADIOS - The walkie talkie handheld speaker is compatible with Motorola Two-Way radios, some models are BPR40 CP200 CP200D CP200XLS CP185 CLS1410 DTR650 PR400 RMU2040 RDU4100 and series XTN AXV CLS DLR DTR RDX RDU RDV RMU RMV. See Product Description Below to Know More Compatible Radios. APPLICATION SCENARIOS - Excellent for user in police, military, nightclubs, bars, paintball, security, restaurants, hotels, bouncer, warehouses, party, building construction, stage, studio, hunting, outdoor and noisy environments. CLEAR COMMUNICATION EXPERIENCE - Omni-Directional Microphone & Electret Speaker delivers crisp, clear sound even in noisy places, showing a meticulous and high-quality sound experience. HIGH QUALITY - Compact and rugged construction, high Impact strength. Kevlar Reinforced PU cable and durable coil cord, high tensile strength and long-life design. Professional electroplated metal pin, Two-pin standard diameter 2.5mm and 3.5mm, space of two-pin 5mm, uses electroplating anti-oxidation design, effective to improve the life of the headset, avoid the poor contact situation. AFTER-SALES SERVICE - 90 days unconditional return and exchange, 180 days Warranty. If you need any help, just feel free to contact us by email. Commixc will provide the best service to our customers. 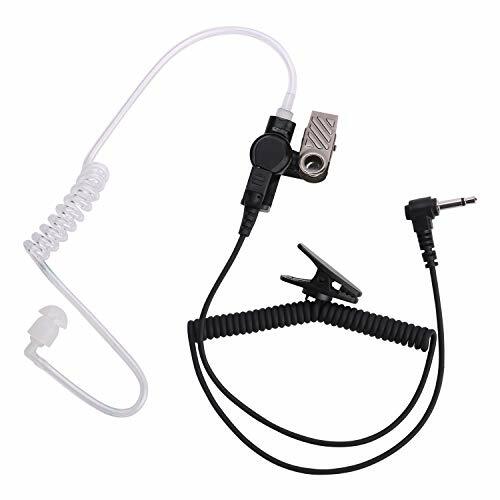 Note: This 2 way radio earpiece is compatible with Motorola Radio, DON'T WORK for Kenwood, Puxing, Wouxun, Baofeng.Please make sure it will work with your radio. We are the manufacturer of the "LSENG",we can offer high-quality product for customer, and the product QC 100% before shipping.Please kindly check the 5 Bullet Points above and the suitable models blow for why you choose LSENG LS-ER02M-2! Two-pin standard diameter: Ear 2.5mm stereo (top pin). If you can't make sure this headset can work on your two way Radio, please contact "LSENG" and tell us your Radio Brand and model. Notice: if the sound quality get fuzzy, please disconnect again and make the connection at the right position. If the issue still not solve ,please contact us. 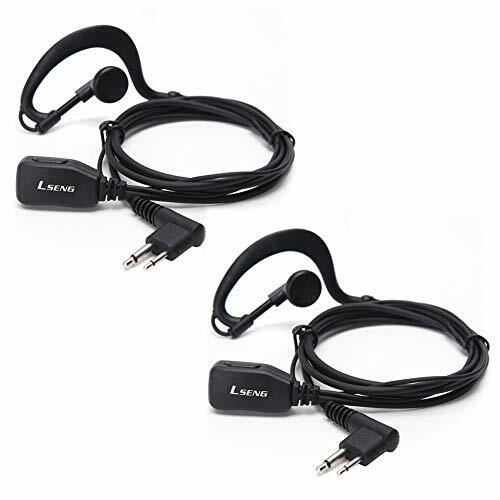 Clip-Ear Headset/Earpiece Mic for Lseng T-518 and Motorola 2 Two Way Radio or Walkie Talkie. Two-pin standard diameter ear 2.5mm and 3.5mm stereo;space of two-pin 8mm. 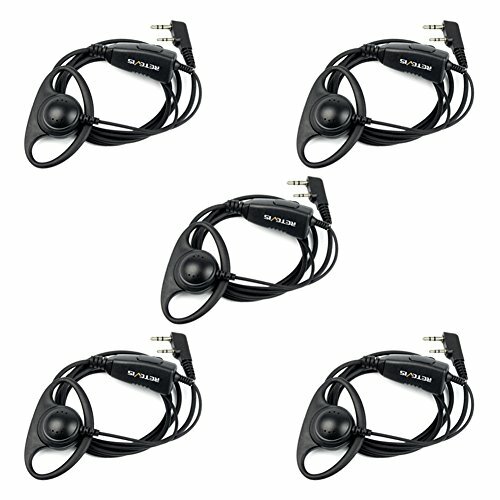 Comfortable radio earpiece and won't hurt your ear during long time wearing. Simple and Convenient return process;60 days warranty and 30 day return with no questions asked. Modular design, a 180 rotating speaker that allows you to listen with total comfort. Comfortably and discreetly delineating from the top to the back of the ear. It adapts to any occasion of work with the clip anywhere and it is easy to operate PTT online. From the design to the manufacturing phase taking into account the durability. It is suitable for police, armies, nightclubs, bars, painting games, security, restaurants, hotels, bodyguards, warehouses and noisy environments. With call buttons and high clarity sound, earplugs can be easily placed in your ears, keeping your conversation private, providing excellent durability, reliability and performance. for APX 1000, APX 2000, APX 3000, APX 4000, APX 4000XH, APX 6000, APX 6000XE, APX 7000, APX 7000XE, APX 8000, APX 8000XE, XiR-P8200 XiR-P860 XiR-P868 -P8660 XiR-P8668 combat. 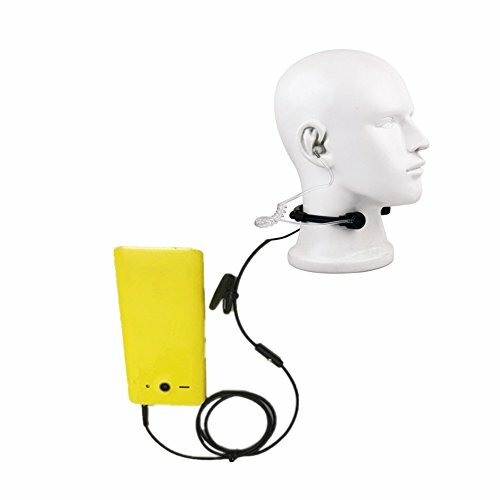 This kit is ideal to avoid the inconvenience of the typical headphones, it is not necessary to remove the belt walkie talkie, it is very convenient to speak through this headset. With call buttons and clear, loud sound, earplugs can be easily placed in your ears, keeping your conversation private, providing excellent durability, reliability and performance. Built-in microphone with an inline PTT (Push To Talk) Button that clips on your shirt, so you can use your radio device to communicate discreetly and easily, whether you're in security, retail, and hospitality . Hearing aids fit perfectly in your ear, and you can hold them anywhere to fit your ear canal, keeping your conversations private and delivering exceptional durability, reliability and performance in a discreet environment. Excellent for the user in the police, military, discotheques, paintball, security, restaurants, hotels, gorilla, warehouses, party, the construction of buildings, the stage, the study, hunting, outdoors and noisy environments. 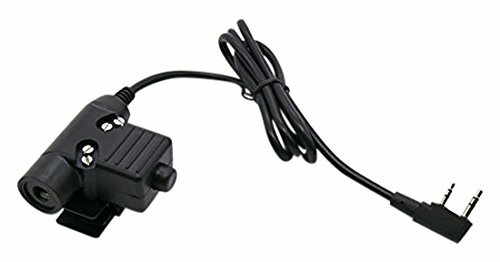 Caroo Military Adapter Mobile Version U94 Type Headset PTT for 2 pin Midland 2-Way Radio Walkie Talkie LXT 600 560 535 500 etc. The Military Adapter Mobile Version U94 type headset PTT combines the most sophisticated surround sound listening electronics with a new slim-line profile cup design. The u94 type headseat PTT fit military standard version plug. The Military Adapter Mobile Version PTT can be clipped on to clothing or anywhere you need it and makes it safer and more convenient to communicate with others. Clear sound, strong and durable.